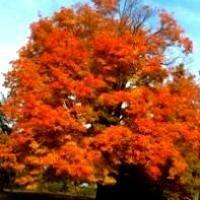 The Sugar Maple Tree is a deciduous tree that provides outstanding fall color and sweet maple syrup. They are well known for their brilliant fall colors and sap, which is the main source for maple syrup. For a stunning display plant them in rows along your street, in your drive if you are fortunate to have a large one, or just one to provide shade and fall interest in your garden. This tree is noted for its impressive fall beauty. Just imagine the scene, flaming crimson, vivid orange and brilliant yellow displayed on your tree simultaneously. The amazing effect of changing colors is really impressive, and provides one of the most remarkable fall displays of color you are likely to come across. These trees are amongst the most breathtaking landscape trees available for a number of reasons. They grow straight and true with a rounded crown that’s attractive for your yard and just the thing for delivering a bit of welcome shade on a hot summer day. Mind you they can grow up to 100 feet, under certain conditions, although typically they grow between 50 to 70 feet, so make sure you have the room and space to accommodate them. In contrast to a lot of trees, these will do well even in the shade of other trees, and as they are extremely adaptable don’t mind heat or drought. Probably the most extraordinary asset of this Maple is its sap. Sweeter than the sap of other Maples, it produces syrup that is less cloudy and of much higher quality. It’s really easy to drain off sap and boil it down, enabling you to share your surplus syrup with friends and family. Furthermore, the Sugar Maple is prized for it's wood. Being extremely hard and dense, it is an excellent choice for just about everything from furniture to flooring. Spectacular fall color, beautiful and hardy shade tree, delectable maple syrup… any one of these wonderful features make this an outstanding choice for your garden. To put it in a nutshell the Sugar Maple has it all.